EBooks aren’t really anything radically new, as the hypertext editing system and electronic documents have been in existence since the 1960’s but didn’t proliferate until the birth of the world wide web and then not in the form that we know now. Even electronic book readers have been around since 1998, but these early devices failed to capture the imagination on an unsuspecting public. 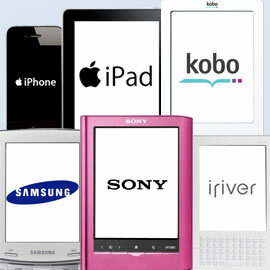 It wasn’t until 2009 when Amazon released their first Kindle and the Sony e-reader emerged that eBooks seemed to provide a serious alternative to the paper varieties. These devices at least, present something similar to the process of actually reading a book, were of a similar size and you could turn the pages. However, roll forward to January 27th 2010 when Apple introduced the world to the iPad, a complete game changer. Who would have thought that in less than 2 years sales of pad devices would to outstrip that of PC’s in number of devices sold? Not only that, Apple had made agreements with five of the six largest book USA publishers to sell eBook versions in their online e-store on the iPad. Now you don’t even have to visit the bookshop anymore, you have it right with you all the time, in the palm of your hand. 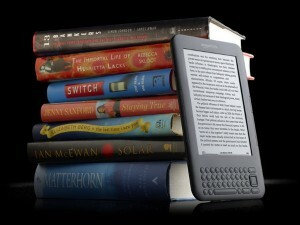 Since then sales of paperback and hard-back books have exhibited a rapid decline whereas e-books sales have soared, to the point that e-books sales will very soon dominate the market. That day does not seem so far away and sad that though it may seem we have already witnessed several well-known book retailers disappear from our high streets. The plug has been pulled and it seems hard to see anything stem the tide towards a world dominated by digital e-media. In our transient, fast moving, consumer society, we seldom hold on to anything that long; we read a newspaper for a day, subscribe to a weekly or monthly magazine, read a newsletter; collections of small snippets of information and articles that can be consumed and then disposed of at will. We pick and choose. For that medium the e-book is just unfathomably ideal and much kinder to the environment. Even the humble paperback novel, clutters our shelves, until eventually relinquished to the second hand books store, the charity shop or the recycle centre. Of course no one can foresee good old paper books disappearing for good. There’s still nothing that can beat thumbing through a really good book, feeling the texture of the paper, absorbing the images within a classy coffee table photographic portfolio, or that delicious smell wafting from a freshly printed novel. But you never know, those boffins at Cupertino may soon come up with an App to replicate even the smell of a book and who knows what else, the smell of your bookstore coffee shop perhaps? However, what gets printed in the future is going to be far more selective, that’s for sure. How long before we see mainstream newspapers and magazines becoming digital only. We already have digital only novels, and some have now even won major writer awards. In the world of photography we have seen a steady growth of downloadable e-books. This is seemingly fast becoming the de-rigueur method to portray your work, provide tuitional aids, illustrated tutorials and essays on any aspect of photography, especially for the online photographer. It’s instant, it’s so accessible and it doesn’t involve a lengthy and costly print run. It opens up a whole new world for the budding amateur, and broadens the consumer horizon for the serious professional too. This has also spurned the growth of a new form of book, a much shorter, condensed mini-book, typically from 20 to 60 pages in length, just enough to delve in to a subject with sufficient depth to entice and inform the reader without becoming too technical and overpowering; deeper than a magazine, lighter than a manual, and in many ways for our modern society, just perfect. As you have probably guessed, I’m a fan of the e-book and although I love good old fashioned books too, my house is full to the brim with books. As a frequent traveler and overseas worker I can now carry a whole library on one device wherever I go. My iPad typically houses over 170 books, including a mixture of novels, how-to books, magazines, instruction manuals, technical papers, and so on, and that doesn’t include audio books which are my favourite way to while away the hours of a long haul flight. No longer do I have to reach for some tattered instruction manual to find out how that strange function on my flash is set … it’s on my iPad. Ebooks can come in a variety of formats and contain various implementations of DRM (digital rights management) protection to prohibit piracy. The most common format for commercial e-books is the epub (electronic publication) format, which has been adopted by the majority of the major publishing houses and a version of which is used by Apple’s ibooks. The format we’re perhaps most familiar with is PDF (portable document format) from Adobe, which is widely used for just about anything else, and has been around in a free format since 2001. PDF is the format I prefer and just about every e-reader will happily display PDF files. The chances are if you download a user manual, instruction book, or an online photographer’s e-book it will be in PDF format. This, in my humble opinion, is by far the best format for general use. Magazine publishers please take note. Sadly many magazine publishers have seen fit to produce individual Apps to show case their particular magazine and specific content. However, almost all of these overly complicated show-case Apps fail miserably. Although I can see the need to link other media and have embedded video clips, if the App doesn’t work like a ‘normal’ magazine or book and allow the user to simply flip through the pages at ease and speed, then it doesn’t work and will eventually annoy the reader. First and formost an e-book must always emulate a real book to be successful, and that’s why a good PDF file reader wins hands down any time. We all know how a book works, why attempt to change that? One gripe I do have with some main stream e-book publishers is cost. Come on guys, how can you possibly charge the same or even more than a paper version, which does happen in many cases. A recent search for Photoshop CS5 for Dummies revealed the Kindle version to be £2 more than the paperback on Amazon UK; that’s crazy. E-books should be significantly less. There’s no physical media so why charge more? This type of pricing seems to be more prevalent in so-called technical how-to books for some reason. This comes across as greed and crass commercialism, and is only going to fuel continued online piracy and will eventually affect the high end e-book market in a similar way it has done to the music industry. Sadly these corporate guys never seem to learn. Thankfully there are many e-book bargains and very low priced books to choose from, particularly from new novel writers looking to get a foothold in the market and attract new readers. I can only applaud this strategy as it works all around. You’ll also find many of the classics as free downloads, since they out of copyright, but do be aware of some unscrupulous suppliers who add an fancy cover and then charge for these. For us photographers there are now a multitude of new e-books to choose from. One particular success is Craft & Vision, the brainchild of well-respected Canadian photographer David DuChemin, where there are now over 40 titles on all sorts of aspects of photography from over 15 different authors, and each for only $5. Each are beautifully laid out, well writen and of a high standard. Their site is well worth a visit. 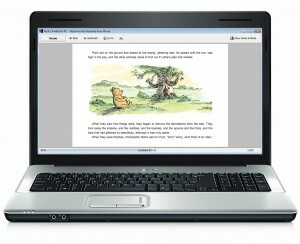 I admit, I used to find it hard to read story books on a computer screen, and although reading software has improved significantly for the humble PC, I still find it much more enjoyable to have a book in my hands. However, give me an iPad and that experience is now comparable and in many cases can be more fulfilling. I can sit and hold it like a book, flip the pages, take it where I want, lookup words, zoom right into pictures in brilliant colour, adjust the text size, read in the dark and I never lose my bookmark! So if you haven’t sampled an e-book and tried an e-book reader perhaps it’s time you did!